With Decisia 5.1, it becomes possible to make any metadata field mandatory. 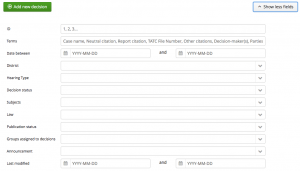 In addition to the metadata fields that were already mandatory by default (e.g. : the date), you can now decide in advance and according to your needs what additional metadata fields must be completed before saving your entries in your database. To move forward with this option, all you need to do is define these new “mandatory” field with Lexum’s Customer Success team. To help your users classify your published content, Decisia has allowed users of the “Announcement” metadata field to qualify their decisions as New, Translated or Corrected. Decisia 5.1 now lets you customize these announcement labels to best fit your needs. If this new option suits your needs, simply contact Lexum with your choice of labels and we will gladly modify them for you. New search fields can now be found you in your administration interface. These fields can be expanded or collapsed to allow editors or administrators to search more accurately in your database. In addition to the search fields that were already available, you will now also be able to search for your decisions by the following metadata fields: District, Law and Announcement. Finally, this refined search will allow you to improve the bulk update tool, a significant time-saver when dealing with a large volume of documents! For a collapsed or expanded view of your search results, you can now reduce the information displayed by default in your results list. This new functionality will be visible at the top right of your search results, next to the sort, to modify the view of all results, as well as next to each search result to modify the display of individual results.